Hello cats and kittens! Miss me? I’ve missed all of you. It appears I took the month of May off. Hmm. More like I blinked and it was gone. April was a fun blur. 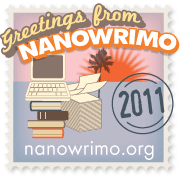 I am still getting a lot of traffic here due to the Herculean Blogging from A-Z Challenge, which is all kinds of awesome. May was full of kids’ music recitals and PTA-planning for end-of-year school events. I’m pretty sure there is a 10th ring of Dante’s Hell reserved solely for PTA in which doomed souls volunteer eternally. But I digress. Onto the month at hand – June. Work gets busy for me as the festival season heats up. Here at moe. central, we consider Memorial Day to be the start of “Summer Tour”, as the band has hosted the Summer Camp Music Festival for the past eleven years. Ah, Summer Tour. There is nothing quite like it. It doesn’t matter what genre you are a fan of, or whether the venue is a 700-acre field or a town park…music in the summer is always magical. As moe. rolls into various towns and cities, I’m the little gremlin behind the scenes paying the bills so they can have their pimped out tour bus and the fans can have their pretty swirly lights, etc. 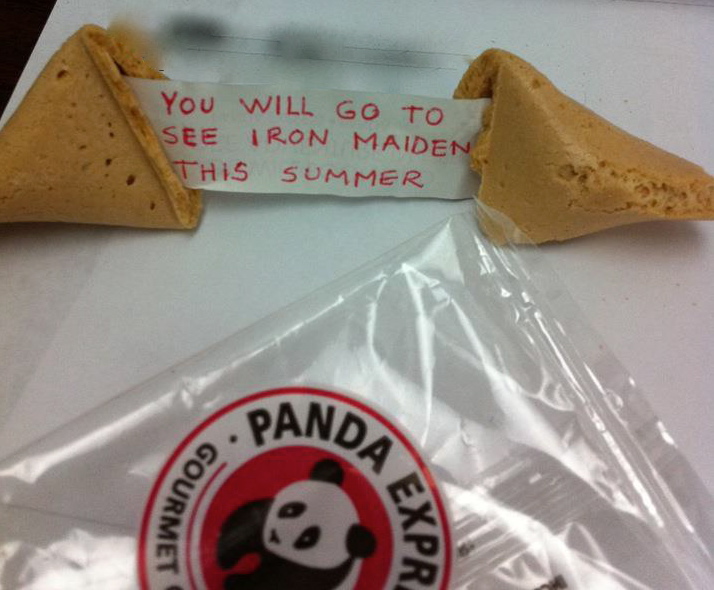 This summer I’ll have the good fortune of catching 4 Maiden shows in 2 countries. Sometimes less is more! Most anticipated summer venue for me: The Beekman Beer Garden Beach Club in Manhattan. I cannot wait to check this place out! moe. plays 2 nights here June 26th and 27th. Beach in Manhattan, you say? Yep, on the East River under the stars on a 200-ton sandy beach. You can lounge on couches with your feet in the sand, or show off your skills over a game of pool, foosball or ping pong. Concerts are held in the 10,000 sq. foot open-air beer tent with the iconic Brooklyn Bridge as your backdrop. Thanks to the never-ceasing miracles of technology, summer tour can now travel to you! First we had the Tupac hologram eerily appear during the Coachella Music Festival. You can see it with your own eyes here. The creators of that hologram are working on an Elvis one, but I’m holding out for a Jeff Buckley one to appear in my living room. Weekly. And speaking of living rooms, another hi-tech phenomenon sweeping the live music world is “couch tour”. Pay-per-view TV has been taken to the next level. Sites like couch-tour.com and iClips Summer of Jam offer you oodles of streaming festivals and shows on subscription – with no bathroom lines or beer lines! No need to sit on Facebook listening to the crickets and feeling sorry for yourself while everyone is at “the show”. This weekend, I watched in amusement as several friends began posting their pictures and music schedules (which of course can be planned via app on your phones now) from their actual Bonnaroo weekend. Phish. Radiohead. Fans standing in a dusty field looking hot and tired. Then…up popped the virtual Bonnaroo weekend “Couch Tour” photos on Facebook. Who needs to fly to Manchester, TN when you can attend in your PJs, five feet away from your own fridge full of sanely-priced cold beer and a toilet that actually flushes and can’t be tipped over in the middle of the night? 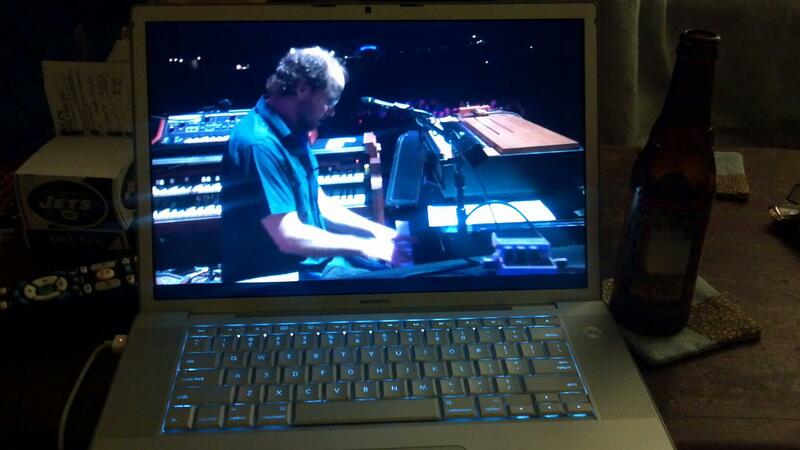 one fan’s front row view of Bonnaroo…from Boston. A Facebook friend posted the above picture on her wall – she tagged a number of friends (probably those she normally goes to concerts with in 3-D real-time real life). And the place tag: “MY LIVING ROOM”. Is this the end of Summer Tour as we know it? Nah. I don’t think so. 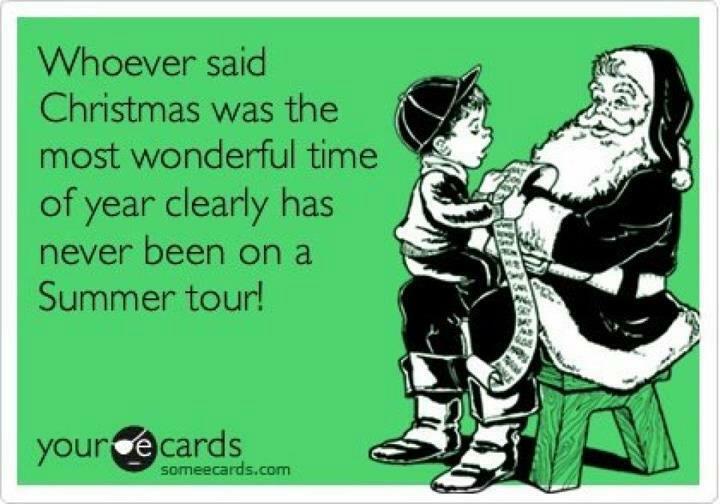 It’s a convenient way of saying “been there, saw that, bought the T-Shirt” but music fans will always want the real Summer Tour experience: the sweaty, grimy, unpredictable weather-related, beer-sloshed, fun-soaked concert under the blinding sun or the blinking stars. With the pretty swirly lights from the band on the pimped out tour bus. (Yay, job security for me.) ‘Cuz that’s a big part of what rock n roll is all about – along with the connections and memories of the people you meet and the places you go on tour. Wishing you all a safe and stellar Summer Tour! I almost got tripped up on letter Y. One day away from the finale – I can’t be fresh out of ideas! All I kept thinking was yogurt. But I didn’t want to write about yogurt. I do eat it every morning (greek non-fat vanilla mixed with non-fat plain to cut the sweetness) but that is WAY more info than you need to know about me and yogurt! According to Phantasy Tour, an impressive website that tracks a crazy amount of stats on jambands, Yodelittle has been played live 303 times to date. It debuted on 2/15/92 at the Scrapyard in Buffalo, NY. And was played most recently at Ram’s Head Live in Baltimore on 3/10/12. It is still a crowd favorite, and I love hearing the fans roar in approval when they recognize those opening notes being picked out. The show list was fun to peruse. I had forgotten about that little gig at the long-gone Scrapyard. I love that it was played at 14 of their 24 shows at the legendary Wetlands Preserve in NYC (if I’m counting correctly.) In the early days, it was played at Frat house parties, like Pi Kappa Alpha at RPI in Troy, NY. But it’s also been played at venues as large as the Molson Amphitheater in Toronto, Canada. How cool that it was played in the middle of the ocean twice – once in 2004 aboard the Norwegian Sun, and again in 2007 on board the Norwegian Jewel; two fan cruises that moe. orchestrated. Fans in Yokohama and in London have heard it live in their cities. I hope you’ve enjoyed my little stroll down Yodelittle memory lane and the song’s ongoing legacy. Do you have a “Y” song, or any song, that you love and would like to share? “But dude…it’s on our rider.” Ah yes, magic words in the music biz. What is this sacred document I speak of? A tour rider is a written set of requests or demands made by an artist prior to a performance. To ensure the comfort, safety and happiness of the artist, the promoter or venue will do their best to honor the details on the rider. From deli trays to daiquiri mix (don’t forget the blender! ), from herbal tea to JD, items on a rider provide both a comfort and a service to the entire entourage. By providing as many items as they can, the promoter shows he/she is paying attention to the details. Imagine agreeing to work for a company, job site unseen. And when you get there, the cubicle you are supposed to spend 8 hours working in is filthy. There is no chair for you. To do your job properly, you need a .9mm mechanical pencil, and all that has been supplied is a broken crayon and a scented marker. Lunch was supposed to be provided, and all you find waiting is a limp braid of string cheese and some stale crackers. Dude, you should’ve had a rider! moe., the band I work for, plays an average of 70 shows a year, and every show has a contract that passes through my hands. And each contract contains a standard rider. The Production side of a rider is all tech specs and usually pretty boring. But the Catering and Hospitality section of a rider, depending on the band or diva you are dealing with, can be pure comic gold. It can become a rock n roll scavenger hunt as promoters send runners scampering to find specific items. You can find some ridiculous and over the top tour riders here. Some, like Iggy Pop‘s and the Foo Fighter‘s riders, read like stand-up comedy. (Click and read them, trust me. Very funny!) Others have requests that make you do double-takes and spit-takes. Say what? Janet Jackson prefers Votivo Red Currant scent candles and organic creamy peanut butter backstage. Bruce Springsteen has simple needs – among them cinnamon raisin bagels and assorted yogurts (but NO lemon). Adele also has some no-nos: “North American beer is NOT acceptable.” Faith Hill apparently likes astro-turf in her artist’s compound. Aerosmith insists their VIP guest room be decorated in an “East Indian style”, lined with dark colored pipe and drape. And yes, Van Halen really did ask for all the brown M&Ms to be plucked from the bowl. moe.’s current rider reads pretty standard. Practical, classy and 90% organic (like them). At one time, they used to request diapers. One never knew when a wife and baby might pop in on tour and experience a diaper emergency at midnight! Packs of white cotton socks were also kindly requested. Logical enough – take ten adult men, stick them on a tour bus for 3 weeks with no laundry facilities… clean socks after a gig are gratefully appreciated! Nowadays, the band is pushing a greener initiative – asking that when possible, cloth napkins, real silverware, gallon jugs of spring water instead of individual bottles, etc can be provided to cut down on waste. And there are some really cool organizations out there to help put any excess (food, etc) to good use – Rock and Wrap It Up does just that. They box up all prepared but untouched meals following rock concerts and sporting events then deliver them to local food banks and charitable agencies. Some promoters really go above and beyond. One told me once that he, knowing the singer of a certain band was a skilled pilot (who could that be?) and its drummer a avid golfer, made sure there were aviation and golfing magazines in their dressing room. Very thoughtful and trust me, I don’t care how big the band is…they will remember that kindness, that extra mile. 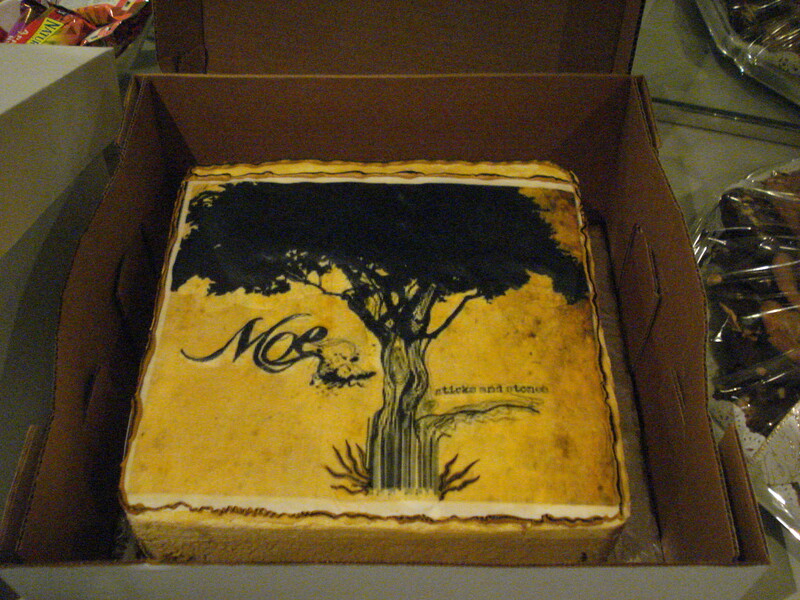 Almost too pretty to eat - a cake with the band's Sticks and Stones cover arrived backstage in NYC one night. The band cut pieces and shared it with the crowd. There is definitely a certain comfort in finding your requested items, night after night, no matter what city/town or venue/bar you find yourself in. I know that on any given night on tour, I can walk into moe.’s dressing room and usually find red Twizzlers and a good white wine. The one thing that used to be on their rider, yet still remains elusive however, is an original G.I. 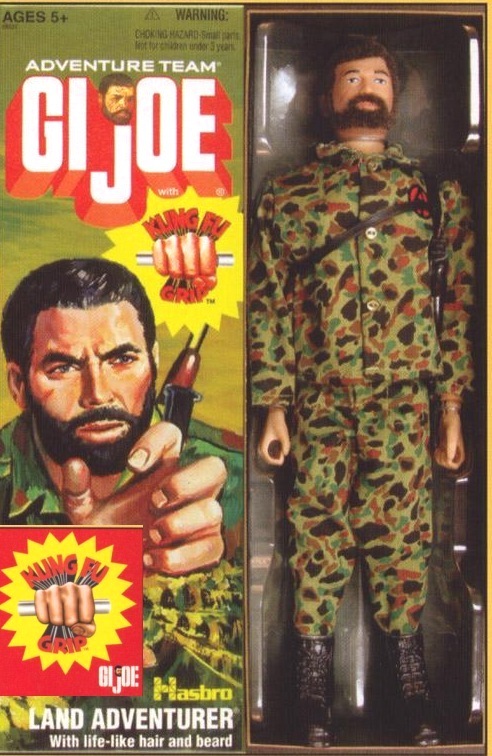 Joe with Kung Fu Grip. The bass player had one when he was a kid, and has always wanted a replacement. This is a born-again meat-eater’s story. Or a recovering vegetarian’s story. Not advocating one way or the other, and I hope to offend no one! I meandered down the path to vegetarianism in my early 20s. It wasn’t a stretch – I had grown up in a Kosher household (no pork products) and it was a fairly health-conscious household to boot. My parents were reading labels, avoiding BHT and eating tofu way before it was fashionable to do so. I moved to New York City at age 23, and it was the perfect storm of a) living alone and cooking for myself for the first time b) not really knowing how to cook meat and c) NYC – a bazillion restaurants featuring every cuisine you could dream up. I slowly ate less and less meat, until I wasn’t eating it at all. And that was OK – I hadn’t been enjoying the feeling of über-fullness after ingesting red meat anyway. I knew it was a healthier way to go. So vegetarianism began as a social thing – I was young and busy and wasn’t going to mess around cooking elaborate meat dishes for myself. No, grab a bean burrito and head out the door to party! Then it evolved into a health thing. And as I began reading more about it, it came full circle as I became aware of the environmental and ethical implications. I found my nutrition niche, I guess you could say, a few years into it: I became a lacto-ovo pescatarian. Meaning I would eat milk, eggs and fish – but nothing else with a face or parents. My husband – omnivore – is an amazing cook. He probably cooks vegetarian food better than I do – but he also enjoys a big ol’ steak on the grill, so at times, we are often running a restaurant here in our house: 3 different menus between him, myself and our daughter. We rarely eat packaged or processed foods, but we all have our hang-ups, allergies, and things we will and will not touch. On our 10th anniversary, we went back to the Inn where we were married, and the chefs there wanted to create a menu for us. I knew whatever they made would be amazing, so I told them I wouldn’t be opposed to eating items with meat stock in them. It was there that I was introduced to applewood-smoked bacon. Or as I like to call it, my gateway meat. After 16 years of “no thanks, I don’t eat meat”, I was ravenous for…bacon. Don’t get me wrong, I still eat a mainly plant-based diet, but I realized I had been missing certain flavors that just cannot be recreated by meat-substitutes. I am still trying to be responsible and sensible about it – grass-fed and organic when possible, still in moderation. …and Chuck and Vin and Jim. 5 guys named moe. There are days (well, nights) when I go to shows and I spend most of my time backstage schmoozing with people or crunching numbers with Skip – tour manager extraordinaire – or chasing my kid and preventing her from eating all the catering that is supposed to be for the band when they come off stage tired, sweaty and in need of food and (if it’s Jim) Yoo-Hoo. I can go a whole night without even stepping out to Front of House or side-stage to watch a song or a set. Then there are other nights when I stand there in total awe. When each song sounds better than the next, and more amazing than the last time I heard them play it. And then they do something like this – moe. plays “Crab Eyes” live on iPads. Video dedicated to the memory of Steve Jobs. They set down their guitars and stepped away from their percussion and drum kits and re-created a fairly flawless facsimile of one of their songs…using iPads. Proving that true musicians can master ANY instrument. And just play the hell out of it.